Two young men with learning difficulties were at risk of becoming isolated in their homes because they could not use public transport. 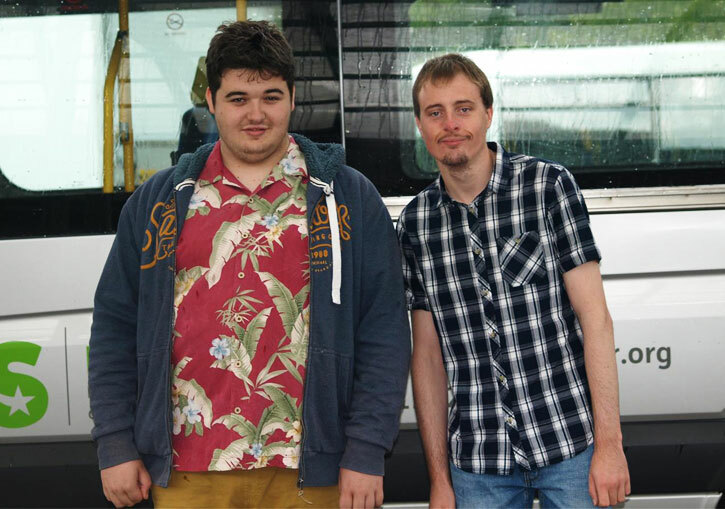 Dan Bennett and Gareth Williams both have autism which means travelling on buses or trains on their own makes them very anxious. Thanks to LiftTraining, a specialist travel training programme run by National Star, both now have friends, can travel on their own and even have paid work. Now Dan has paid part-time work. Gareth, aged 17, also travels on his own now, and is able to access a full-time college course. ‘He lacked confidence and wasn’t comfortable about handling money. The noise and the people on board would make him very anxious,’ said Gareth’s mum Sue. Mr Chris Brierley, Deputy Police and Crimtaffe Commissioner for Gloucestershire, met Dan and Gareth to find out how the scheme has changed their lives. ‘It was lovely to meet Dan and Gareth and their mothers, for me it really showed me why it’s important the Commissioner’s Fund supports schemes like LiftTraining,’ he said. ‘Both Dan and Gareth would be isolated but for the great work done by National Star College and the LiftTraining programme.